I hope all goes well. We just got our power back after a week without. Hope your storm goes much more smoothly. Also hoping nothing interferes with your trip. this really is such a bittersweet season. i've enjoyed visiting your blog. i miss the mountains very much. we used to spend most weekends in the blue ridge mountains when we lived in VA & northern SC. now we are on the coast of NC. i'm hoping your weather settles. we are much calmer today than yesterday here on the coast. It is cool and raining here this morning. It really feels like Autumn. Love the leaf picture. Your photo makes me miss the fall color I'd see when I lived around Chicago. Colorado has the aspens, but not much else. Autumn is temperamental, and we love her that way. Think of all the halloween candy on the way, w00t! Try to soak up as much rain as you can so we don't get so much when it makes its way up here. Our leaves are just starting to turn and I hope to be able to take some nice photos like that. Beautiful. The richness of the orange makes me want to cozy up, but the hot weather we are having won't allow it. It is my favourite time of year. I love the speckley look of the leaf. Another breathtaking photo! You show us such amazing pictures. Thanks for your lovely words too. I hope the weather gives us at least a little break this weekend. Hopefully no more power outages for you. Enjoy your weekend! thanks. i love and appreciate your comments, always. You captured autumn perfectly, in words and in your wonderful photo. I will look forward to enjoying your blog. This is great. Thanks for sharing it with OSI. I like the idea of mosaics and restoration. What a great source of hope! ..(a somewhat early-happy birthday greeting! )-thanks for a very nice photo and a fine poem..
Beautiful photo I love the contrasting colours. I hope the weather brightens for your birthday tirp. amazing as always - words and photos. best of wishes for good travel weather. COOL Fall weather and rain sounds WONDERFUL! 99 and HOT yuck here! Aah to see REAL seasons! Truth is beautiful! Exquisite photo! I love the harvest of autumn all around! oh that is lovely. I think I know what I will be doing tomorrow - visiting the arboretum. We've had pump issues even over here in the Raleigh area! So crazy isn't it? What a wonderful photo and lovely poem, Just beautiful. I hope the weather manages to hold up for you. I am so excited that Autumn is on its way. It is by far my favourite season.... the colours, the crisp cool air, the fresh breeze, the mist and fog... I am so looking forward to the next few months!!! Wishing you a lovely week ahead my friend!!!! 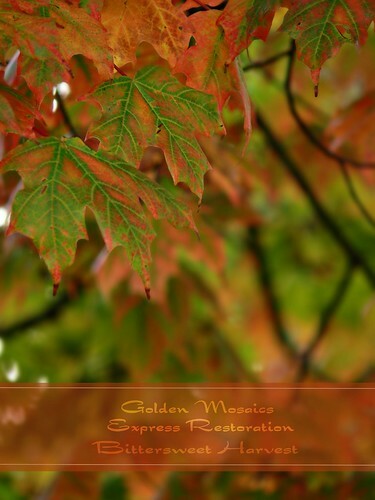 Lovely seasonal Haiku and Autumn colors in the leaves in your photos. Thanks for sharing. Glad the power outage didn’t do any damage.